Sandwiched between the Atlantic Ocean and the Chesapeake Bay, Virginia’s Eastern Shore is home to dozens of festivals and celebrations centered around the region’s abundant fresh seafood and rich agricultural traditions. A growing number of small organic farms, aqua farmers and small-batch food producers are both reviving historic food traditions and inventing new ones. The epicurean mix ranges from down-home cooking and big seafood fests to elegant, chef-led extravaganzas. Join the Cape Charles Brewing Company and celebrate their version of Ground Hog Day. Feast on all you can eat oysters, smoked BBQ and clam chowder while enjoying live music and a roaring fire pit to keep the cold at bay. This is a new tradition that you won’t want to miss, so come out and see if the Eastern Shores’ only K9 Meteorologist, Cape Carlos the Min Pin, will see his shadow! Wander from shop to shop on Chincoteague’s picturesque Main Street sampling chocolate treats as you go. Visit the Historic Main Street Merchants to pick up a card and collect a stamp at each shop and you’ll be entered to win a door prize. Chocolate and free prizes? Talk about a win-win. 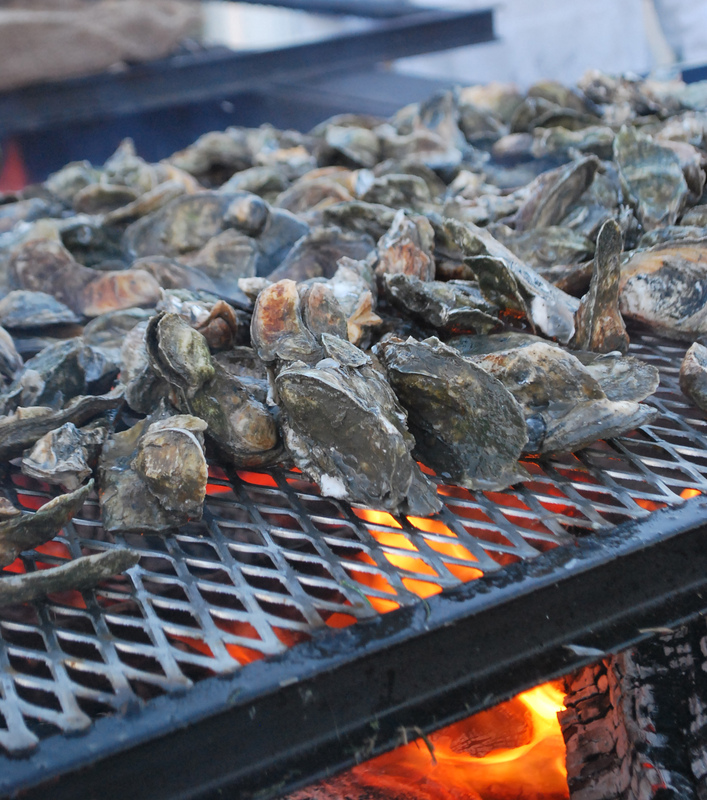 Barrier Island Center Oyster Roast – SOLD OUT, but be on the lookout for next year! February may seem like a chilly time to hold an oyster roast, but the Barrier Islands Center pulls out all the stops to keep guests warm and toasty during their annual shindig. Visitors can dine on roasted oysters, clams, pork barbecue, grilled chicken and sides in the comfort of a heated tent. There are also plenty of hot, freshly roasted peanuts to keep your fingers warm – and coffee from Eastern Shore Coastal Roasting Company to warm you from the inside out. For those who want something with a bit more kick to drink, there is a selection of beer and local Chatham Vineyards wine on hand. You’ve probably heard of Manhattan and New England clam chowder, but the Eastern Shore of Virginia has its very own style of clam chowder. It’s broth-based and clear. Get a taste of this local specialty along with grilled ham and cheese sandwiches, corn on the cob and homemade desserts. Warm up on a winter evening with freshly roasted oysters, a cup of clam chowder or some steamed clams. Get a taste of smoky southern barbecue, dance to live music or win something special in the silent auction. You’ll really feel like a local as you open oysters in Exmore’s Town Park at this community event. Gatherings in fire halls are a long standing tradition on Virginia’s Eastern Shore and this one is sure to be a good time. There will be roasted oysters, steamed clams, oysters on the half shell, pulled pork and all the fixings. For $5 you can purchase a beer mug with two drink tickets. Additional drink tickets are $2. There will also be live music and a silent auction. 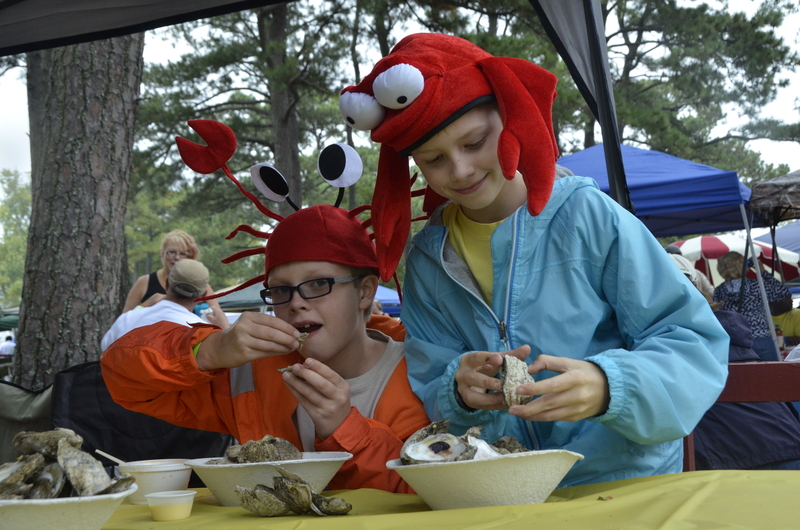 Come for an afternoon of fun when cook masters “steam up the beach” at the YMCA’s Camp Silver Beach, featuring an all-you-can-eat menu of steamed and roasted oysters, clams, chowder, BBQ and all the fixin’s. Sip wine from local and award-winning Chatham Vineyards, enjoy on-tap craft beer, and tap your foot to live entertainment on the gorgeous deck. A silent auction features original artwork by local carvers and artists. Sample items from the Eastern Shore of Virginia’s best restaurants all in one place. Eating all of the region’s top dishes would be no easy task, but at Taste of the Shore you can sample the Shore’s best offerings all in one place. Home to thousands of acres of parks and protected land, some of the Eastern Shore’s most beautiful and historic estates are private and closed to the public. 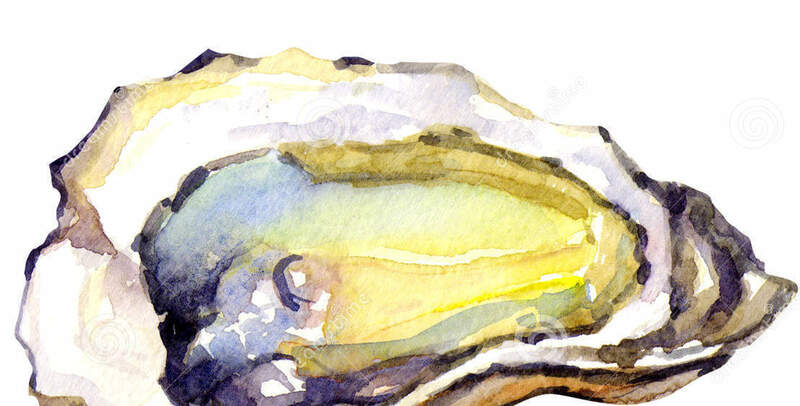 One exception is the annual Virginia’s Eastern Shore Land Trust Oyster Roast. Indulge on oysters, clams, wine, beer, spirits, dinner, and dessert while enjoying beautiful views on a local estate protected by the VES Land Trust conservation easement. Bid on one-of-a-kind auction items and take your chances in the raffle! Space is limited and this is always a popular event, so, book early! This classic Low Country-style shrimp feast at the Cape Charles Museum features steamed shrimp with red potatoes, corn on the cob, smoked sausage, onion and peppers. Keep an eye out for local clams as well. The shrimp boil is accompanied by homemade rolls, coleslaw, desserts and beverages. Beer and wine is available. In addition to the feast there is a silent auction, a 50/50 raffle and live music. This Friday night outdoor concert series, right on the water, starts in May and goes through late summer. Feast on fresh local seafood — blue crabs, oysters, clams, shrimp — with sides of potatoes and sweet corn. It’s at The Oyster Farm at Kings Creek, a restaurant and marina with breathtaking views out over the Chesapeake Bay from every corner. Free admission; food and drink purchase optional. Held in the tiny resort island of Chincoteague, this festival has been a tradition for over four decades. This seafood extravaganza gives you a taste of the best local seafood featuring raw oysters and clams, single fried oysters, clam fritters, shrimp, steamed clams, fried fish, clam chowder and clam strips. There are also plenty of sides with a full salad bar, sweet potato and boardwalk fries and hush puppies. There is live entertainment and beer is available for purchase. Cape Charles’ annual Crabby Blues Festival boasts fun for the whole family with a selection of live music, fresh-caught steamed crabs, a kids play area, arts and crafts vendors, a silent auction and pop-up food. In addition to great local music this festival serves up the freshest crabs in town, as boats bring in their day’s haul of crabs to the park, where they are steamed and served by the dozen. It’s a great finish to a day at the free beach steps from the busy town center. This awesome event is the only time of the year where you’re lucky enough to get a taste of all the delicious local food trucks at once! Plus enjoy live entertainment, all for a good cause. An annual film fest in the tiny beach town of Cape Charles, Experimental Film Virginia brings filmmakers from the all over the world to shoot short films each summer. It all culminates on premiere night, with a big outdoor bash right on the water, featuring oysters and signature dishes from local restaurants and live music that’s just perfect for dancing. Nothing says small towns in the summer like a fireman’s carnival. On the Eastern Shore of Virginia, carnival food isn’t limited to cotton candy and snow cones. At the Wachapreague Carnival, you’ll find oyster fritter sandwiches, clam fritter sandwiches, crab cakes and soft shell crab sandwiches right alongside the hamburgers, hot dogs, pizza and fries. You can even try your luck winning dessert. On Fridays and Saturdays cakes from local bakeries are raffled off. If you don’t have the winning ticket don’t worry. There’s plenty of ice cream, funnel cakes, cotton candy and fried Oreos to go around. Many people visit the Chincoteague Carnival during Pony Penning when the wild Chincoteague ponies are corralled at the carnival grounds after they make their swim from Assateague Island, but before they are auctioned off. Perhaps and even better reason to visit the carnival would be to get a taste of all the delicious food there is to sample. Of course, fries, pizza, burgers and hot dogs are on the menu, but local specialties like clam and oyster fritter sandwiches are the stars of the show. If you need to satisfy your sweet tooth check out the cotton candy, ice cream and funnel cakes. The Eastern Shore of Virginia is one of American’s oldest agricultural hubs and all of that bounty is celebrated at this three-day event packed with artists, crafters, vendors and, of course, blueberries. You’ll be filled with anti-oxidants by the time you leave this festival! Blueberries are on the menu for breakfast and lunch, with blueberry muffins and pancakes dominating the morning and blueberry-studded chicken salad served for lunch. To top it off the Island Creamery, voted America’s Number One Ice Cream Parlor, serves up blueberry ice cream. Each day features a full line-up of live entertainment. A culinary weekend of raw oysters, roasted oysters, steamed clams and more from all over the shore –all at the Oyster Farm Seafood Eatery overlooking the Chesapeake Bay. Contests include the Boat Docking Contest, a clam eating contest and an oyster shucking contest. Plus, there’s live music and of course oysters, oysters and more oysters! It’s time to get crabby! Brush up on your crab picking skills and break out your dancing shoes for our crab feast and music festival. This event is open to the public, but admission will be half priced for Chincoteague Island KOA campground guests. Make plans to attend an annual Eastern Shore tradition held right next door to Edward’s Seafood, one of over a dozen seafood grocers on Virginia’s Eastern Shore. You get your choice of just-caught fried local fish or BBQ chicken, along with all the fixings to round out your plate – coleslaw, sliced tomatoes, baked beans and hush puppies. Just show up and pay for a plate. Picking crabs in the summertime is a beloved Eastern Shore tradition. Experience it for yourself on the grounds of Ker Place, a beautifully restored Federal mansion built in the early 1800s. There will be plenty of crabs for everyone with both steamed crabs and a crab and shrimp boil with potatoes and corn. If you’re not much of a crab picker there will be barbecue and beverages too. Don’t forget your dancing shoes, the roots-rock band The crawdaddies will be rocking the night away. Sample unlimited tastings of craft beer from around the region while enjoying beautiful views of the Chesapeake Bay at Chesapeake Bay KOA. Call (757)331-1776 opt. 2 for tickets. Those who want to discover more about craft beer and Eastern Shore seafood should look no further than ESO’s Craft Beer and Music Festival. Sample craft brews from over a dozen regional breweries alongside fresh seafood and other Eastern Shore specialties. Bring your own lawn chair or blanket and enjoy brews and tunes. Cork & Craft is a wine and beer festival and art show held on picturesque Chincoteague Island. Admission includes live music, great food, an artisan market and kids’ entertainment. This day-long festival offers samplings from various regional wineries and breweries. Ticket price includes unlimited tastings throughout the day and a souvenir tasting glass. Chincoteague Island is famous for its wild ponies but in September it’s all about chili and chowder. Contestants serve up everything from spicy five alarm chili to rich chowders overflowing with fresh, local seafood. Amateurs and professionals go head-to-head for this culinary throw down and the public can purchase bowls of everything. In addition to the soups and stews, look for famous crispy clam fritters (a local specialty) – – a deep fried, tender nugget of dough studded with local clams. Once you’ve had your fill of tasty treats you can take in some hot rods at the car show, enjoy the live music or get a dose of cuteness at the Little Mr. or Little Miss Hot Stuff children’s pageant. This is a pay as you go event. This festival puts a spotlight on smoky scents and frothy craft beer at Sunset Beach Resort in Cape Charles. Brew ‘N’ Que (Oysters Too!) includes platters of smoky barbecue, craft beer and local oysters. Big fun is in store with lots of activities for families and children, as well as live music. Spend Friday night dancing and then come back Saturday for local and international soul food. Cuisines will include Ethiopian, Jamaican, Brazilian, soul food, vegan and vegetarian. Chopped and Cutthroat Kitchen contestant Jacoby Ponder will be on hand cooking and there will be fun for the whole family with kids activities and local artists and artisans. Chincoteague oysters — known for their salty, briny flavor — bring the island community together every October to celebrate the famous bivalves, which are shipped all over the world. Sample crispy single-fried oysters, freshly shucked raw oysters, golden oyster fritter sandwiches, succulent steamed oysters and bowls of Eastern Shore style clam chowder. The feast is rounded out by some greens in the form of salads, and crispy onion-studded hushpuppies. Beer is available on site or you can load up your own cooler and bring it. Tickets for this party sell out quick! Gathering in a town park to feast on fresh, local seafood is just about as down-home as it gets on the Eastern Shore of Virginia and the Soule Arnold Oyster Roast and Clam Steam offers just that! This annual event boasts an all you can eat buffet of salty, roasted seaside oysters, fresh steamed clams, barbecue, clam chowder, sides and desserts. A cash bar is available for the purchase of beer and wine. There’s a silent auction too! There’s a long tradition of pig roasts in the south. Just like our oyster roasts, these feasts brought communities together. Get a taste of a traditional pig roast at Swine and Wine. You can load your plate with roasted pork barbecue, barbecue chicken, all the fixings and desserts. There will also be a cash bar, live music and a silent auction. Local chefs and farmers will be paired up to create delicious farm to table dishes at this intimate affair. Only 125 tickets will be sold for this seated dinner held on a working flower farm with a historic home that dates to 1770. Local artists and artisans will also be displaying their works and there will be a live auction. Saxis Island is one of the Eastern Shore’s best kept secrets, tucked away on the Chesapeake Bay coastline of the 70-mile peninsula. Visitors have the perfect opportunity to explore this unique area at the Saxis Island Oyster Roast. Unlike many other oyster festivals, this oyster roast is held indoors – and features table service. Just hold up a sign and a volunteer delivers steamed oysters, clam chowder and barbecue to your table. You can also gather around a shucking table and slurp fresh, raw oysters. If you like, bring a cooler with your choice of (alcoholic) beverages since there is no alcohol served on site. 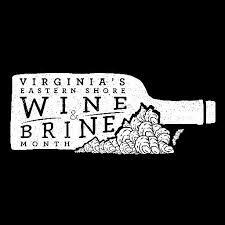 This Virginia Wine and Brine feast is a food and wine lovers dream. Based on the concept that a wine’s taste reflects the region it is grown in, or terroir, this event, held on the grounds of Chatham Vineyards, pairs Chatham Vineyard’s wines with oysters that are cultivated in the waters surrounding the winery. Just as wines are flavored by their region, oysters are also known for developing a distinct flavor, or Merroir, based on where they are grown. The winery perches on Church Creek and is dotted with buildings that date to the early 1800’s. During the annual Ducks Unlimited Oyster Roast, on the grounds of the Barrier Island Center, which was formally a historic almshouse, feast on smoky, roasted oysters and clams, and juicy pork barbecue, baked beans, potato salad, coleslaw and assorted desserts. Festival goers can unleash their competitive side with both a silent and live auction. Oysters are the star of this traditional Eastern Shore roast on the grounds of the Cape Charles Museum, and will be served both roasted and raw. Spicy bacon and potato studded clam chowder will also be available. Non-seafood lovers can chow down on fried chicken, three bean salad, potato salad and homemade rolls. The Eastern Shore is one of the largest clam growing regions on the East Coast, so we know a thing or two about chowder. Get a taste of the best chowder local restaurants have to offer while enjoying views of the Chesapeake Bay from the Oyster Farm Seafood Eatery. This is fantastic information, I will be retiring in a few months to the Eastern Shore of VA and this is great information to know. There is something to do all year around! We’re glad to help, Rhonda. Welcome to the Eastern Shore. We hope you enjoy it!